Summon: Shuffle three Lava Atronachs into your deck. When you summon an Atronach, summon a copy of it in the other lane. Conjuration Tutor is an epic Intelligence creature card. Conjuration Tutor was the monthly card for June 2017. It can be soul-summoned by anybody regardless of participation in ranked. As with all other monthly cards before February 2019, the premium version was not awarded to anybody and must be obtained through soul-summoning. "A Conjuration mage never stands alone." 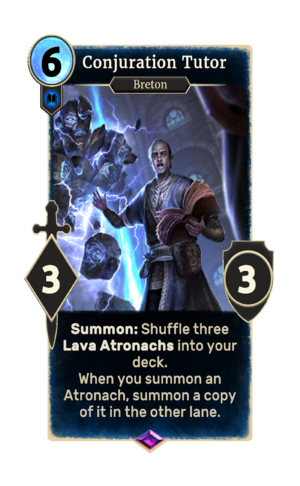 The card depicts Phinis Gestor, the conjuration tutor at the College of Winterhold in Skyrim. When summoned: "My friend would like a word with them." This page was last modified on 24 March 2019, at 21:45.